The dresser had been in the basement when it flooded and had a few issues. The broken drawer (you can see the gap at the bottom right where the broken drawer had pushed the frame outwards) was fixed with a little wood glue and some nails. The top is warped from the moisture, which I never fixed because it is still functional and isn’t overtly obvious (plus its not an easy fix!). At that time I sanded this guy down and stained it with a Minwax Jacobean stain with a high gloss polyurethane coating. It stayed in my master bedroom until we got married and needed a little extra clothing storage. 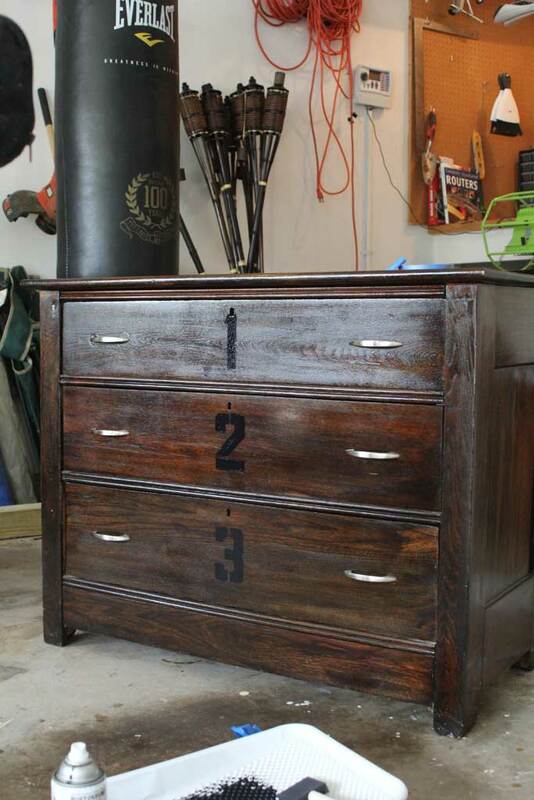 We upgraded this guy for our master bedroom and moved this dresser out into the garage. Unfortunately I don’t have a good picture of what it looked like stained in the master bedroom (one day I’ll get the hang of this whole ‘taking before pictures’ thing). 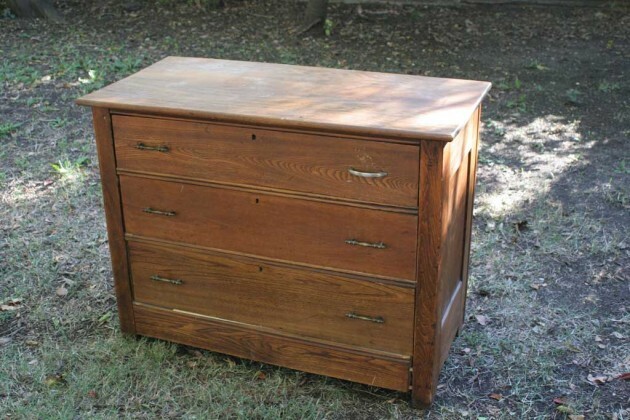 I decided this would be a perfect canvas to do a dresser upgrade that I’d seen around the blogosphere, knocking off this Anthropologie Dresser (you can see some here and here). I didn’t want to make this a big project, so I left the dresser exactly as it was and just bought stencils and some black paint. 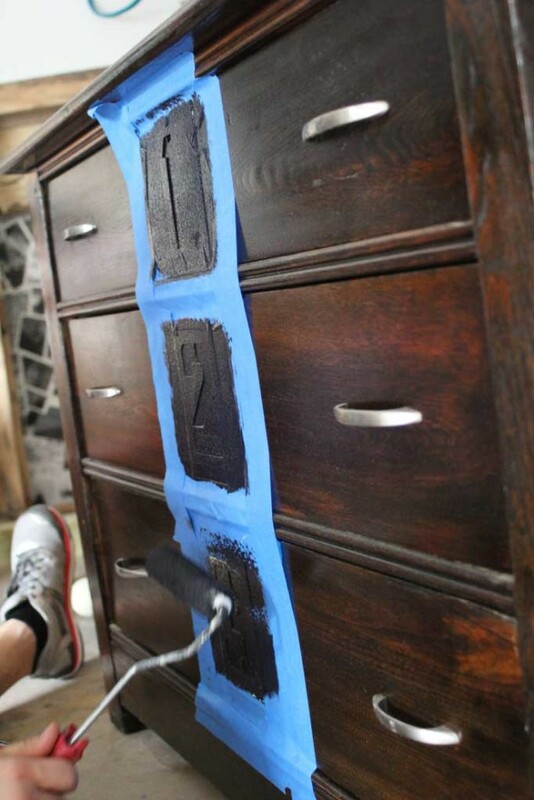 First step, we centered the stencils on the drawer and added some painter’s tape, a little wider than the roller. As soon as we rolled the black paint on we removed the stencils and wiped up with a wet paper towel the one spot that wasn’t as crisp as the rest. 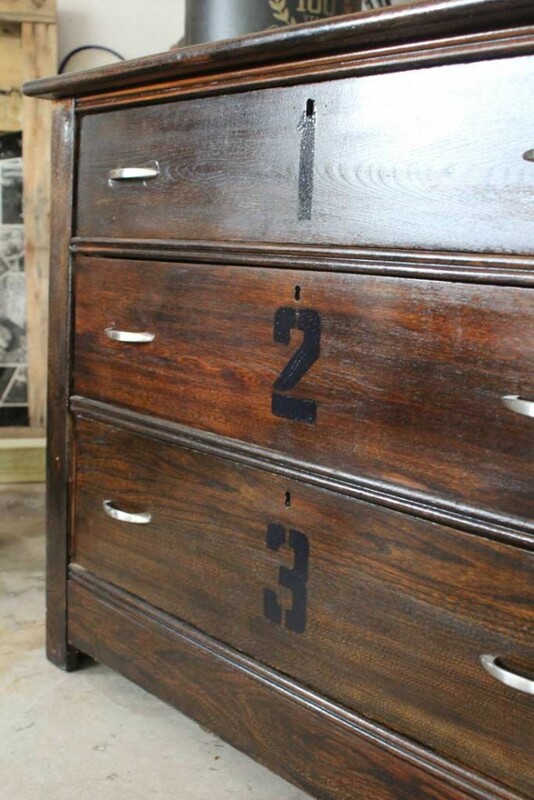 I like that the numbers aren’t super obvious, but think it spruces up the dresser quite a bit! And for 15 minutes and less than 20$ (free if you already own the paint and stencils) it was a pretty stellar upgrade!